As the Engineer Officer of the Armed Forces Inaugural Committee from 1984 to 1985 for the Presidential Inauguration of Ronald Reagan, Captain Brudnicki planned, coordinated and executed all inaugural activities that required engineering support. He then served as the Commanding Officer of the USCGC BRAMBLE (WLB-392), Port Huron, MI, from July 1985 until July 1988. BRAMBLE produced the first two Waterways Management Analysis Studies in the Coast Guard, and while deployed from the Great Lakes to the Caribbean, had 3 drug seizures and assisted with another 3 drug seizures  netting 100,000 pounds of marijuana. Captain Brudnicki was the Commanding Officer of the USCGC CHASE (WHEC-718) from July 1995 to August 1997. CHASE deployed to the Bering Sea for several fisheries patrols. For his final deployment, CHASE joined a Navy Destroyer Squadron to conduct training with foreign countries in Southeast Asia. On their return home, CHASE was diverted to the East China Sea to seize a Chinese fishing vessel that had violated the United Nations Moratorium on High Seas Drift Net Fishing. 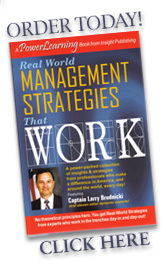 Captain Brudnicki holds a Merchant Marine Master's License, and is a member of the National Speakers Association.